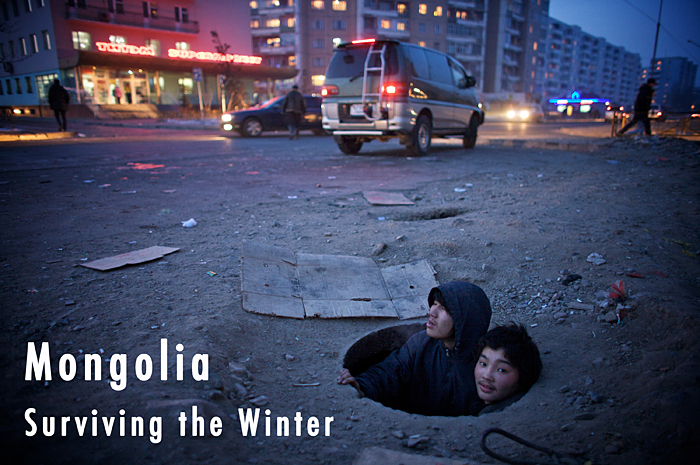 The last part of the Mongolia assignment and it’s a story I feel very close to. On assignment you meet some incredibly inspiring people. No matter what they’re going through they are always open, welcoming and happy for you to enter their world..albeit for a short time. With all the bad press about teenagers at the moment, maybe they should all see what conditions their equals are coping with in other parts of the world. Munkhbat (15) & Altangeret (15) are two incredible young men who are wise way beyond their years. What impressed me most was their resilience to the huge pressure to give up on life. Many street children start drinking cheap vodka from a young age. I met one 17 year old just out of rehab. These boys however still believe in a future. Forced to leave school despite high grades, had their mothers not abandoned them they would undoubtably have become a great success. 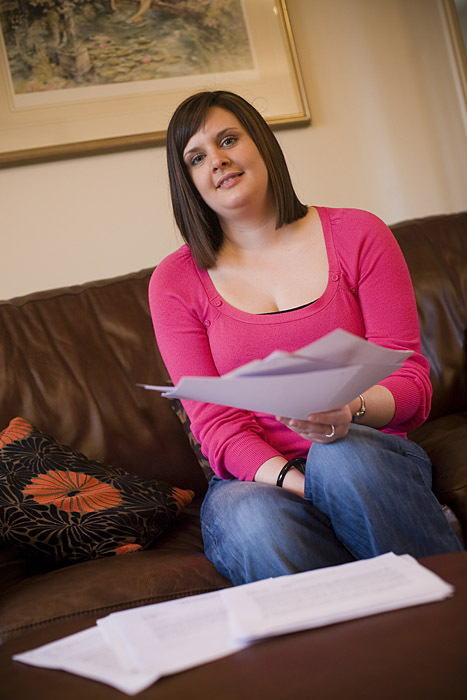 With the help of a local charity the aim is support them in their futures if possible. 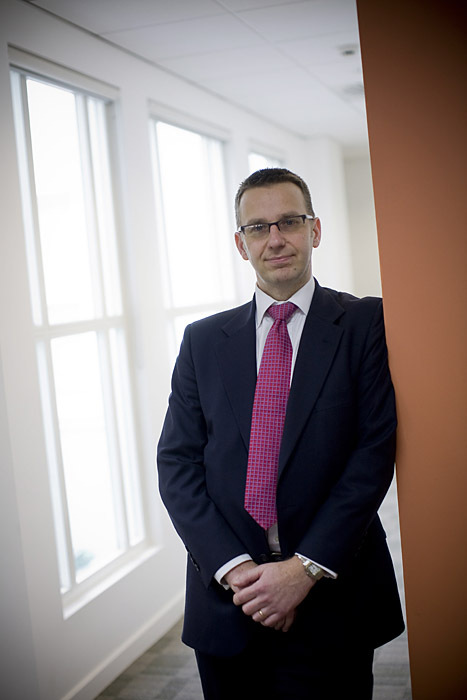 Please feel free to ask any questions and comments about the story..Rich…. It’s been a while since I last put a multimedia presentation together so it was pretty much a case of relearning everything again..! 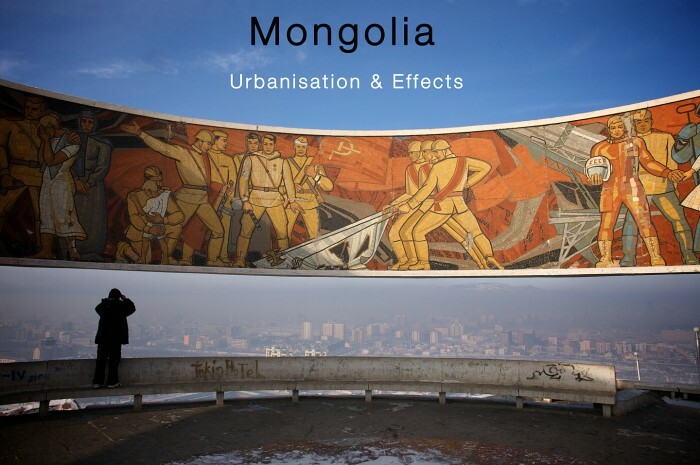 This is Part 1 of 2 from Mongolia with the 2nd hopefully being completed in the next few days. Whilst they take a long time to put together hopefully the extra effort is worth it. Capturing audio, storytelling and taking pictures all at the same time, often in difficult conditions is a challenge but ultimately worthwhile. I hope you enjoy this and I’ll keep you posted when the next one is complete…. After another long night I’ve managed to put together the second story from India. It is linked to the polio story in many ways as a large number of patients receiving treatment at Jaipur Foot are polio survivors. The founder Mr D.R Mehta says the number of polio survivors seeking treatment has declined in the past few years but they are still fitting about 30,000 people a year with calipers and tricycles. The Rotary Clubs of Jersey had a launch night of their polio eradication campaign last week at Government House in Jersey. This is the first step for the Rotary Clubs in Jersey to start raising money and awareness for the international effort to eradicate polio. The pictures we took on our recent visit to India are hopefully going to be used around the world to promote this endevour. Bill Gates recently donated over $255 million dollars to the campaign with the challenge for Rotary to raise $200 million by 2012 so the outlook is positive. 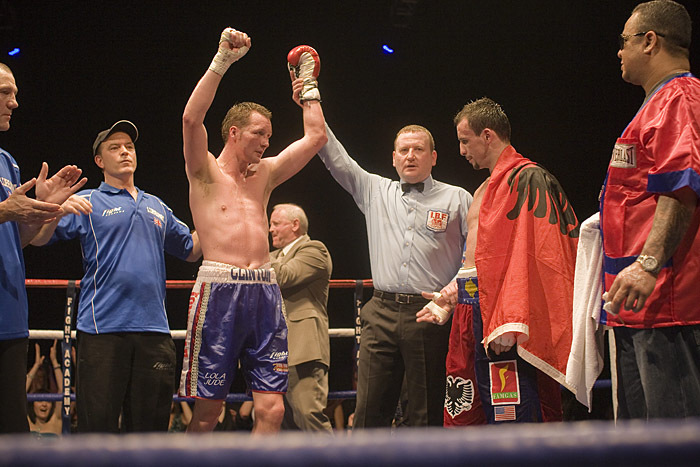 I’ve uploaded some pictures onto my website some please feel free to have a look there. I’m also working on a multimedia presentation so when that is finished I’ll let you know.. The centrespread featured in the Jersey Evening Post to relaunch the Rotary international polio eradication campaign End Polio Now. 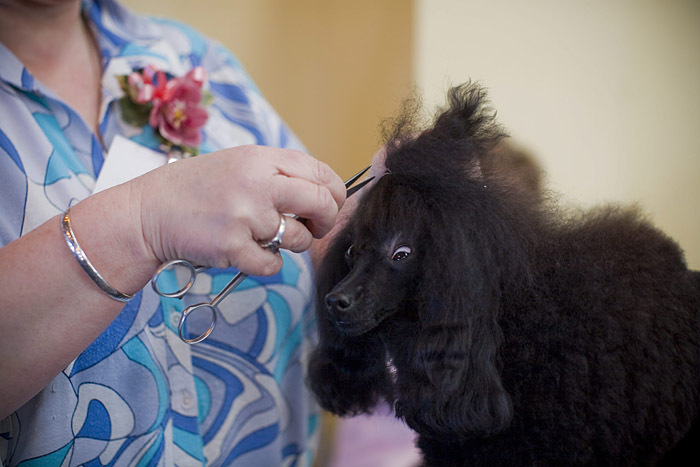 It’s that time of year when the air is filled with the sounds and smells of clipping, cutting, hairspray, tension and other unmentionables. 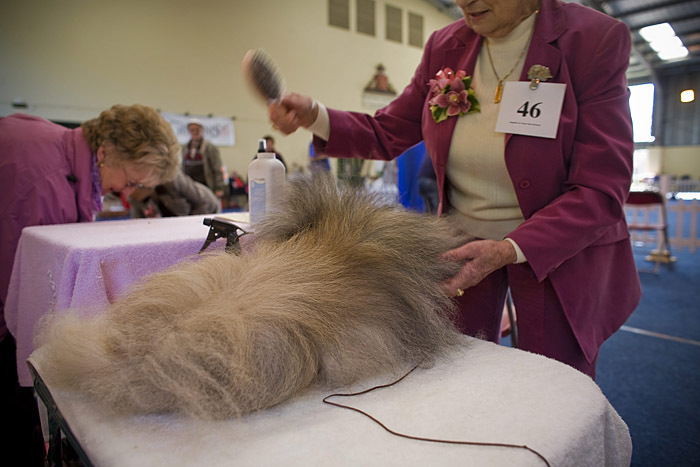 That goes for both the dogs and their owners who preen and prune themselves equally for their big show day of the year. 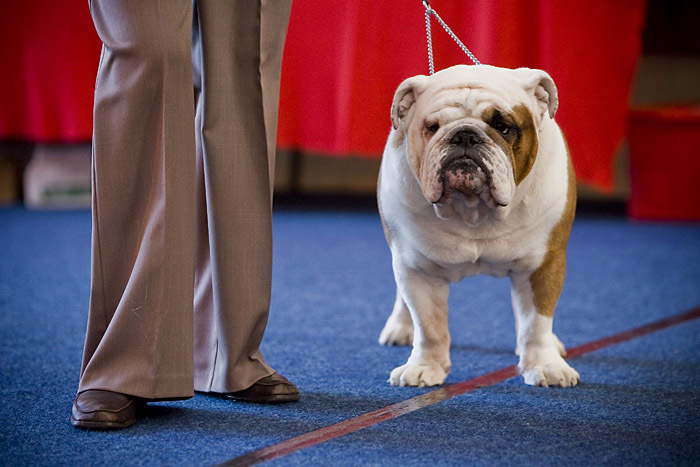 Competition is intense, dog envy is abound. This is the third year I’ve been assigned this job. 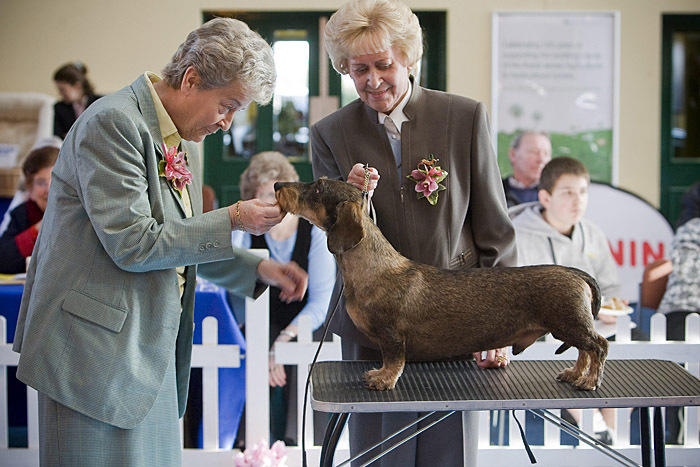 Maybe because the picture desk knows I’m allergic to dogs…maybe because deep down I actually enjoy them and they can be quite good fun and picture rich…Release the hounds….!! 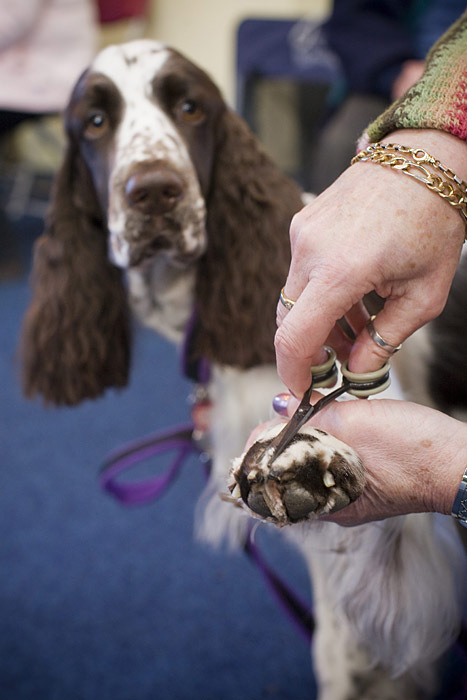 Delphi the English Spaniel getting her toe hair cut. Detail is everything. 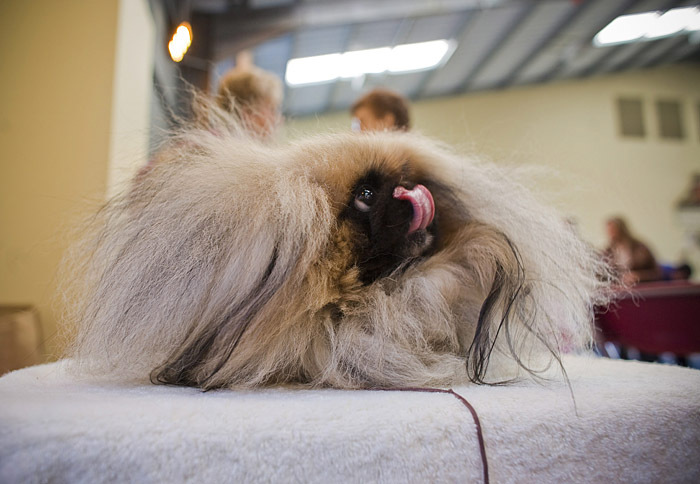 Onyx (8) a Pekingese rests inbetween showing. 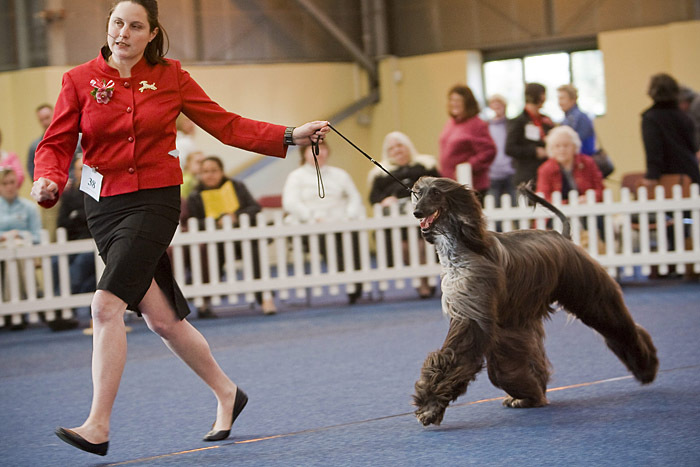 Marie-Claire Hannigan showing an Afghan Hound. 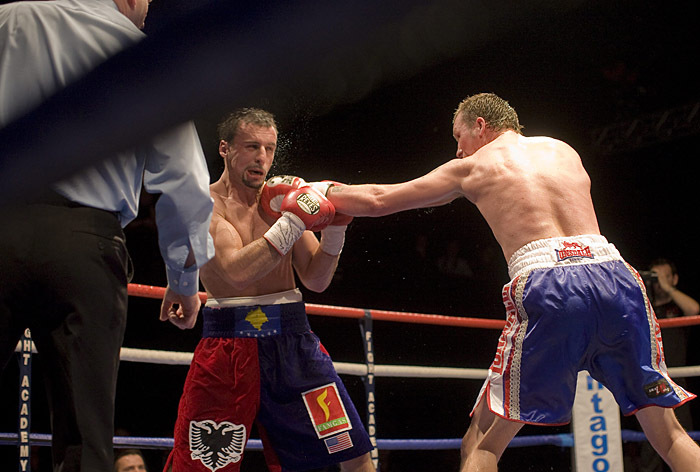 My first week back at the Jersey Evening Post and straight into a World Class boxing match. As with working on most regional newspapers, the variety of jobs your assigned in any one day always makes it challenging. 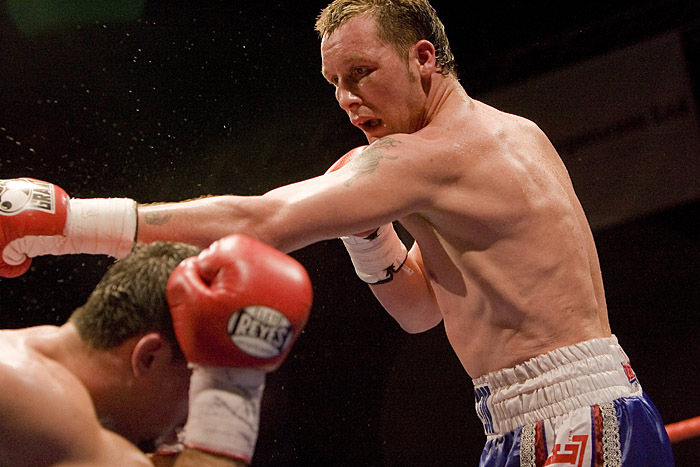 One minute your doing sport, then a feature picture story then everything else from business portraits to news. I’m still ploughing through editing my work from Mongolia and India so this post will be short on words. The hope is to expand on how and why I took a particular picture but when short of time I’ll just let the pictures do the talking themselves..which is the general idea of a press photography anyway..!! The final day shooting today and back at the limb centre. 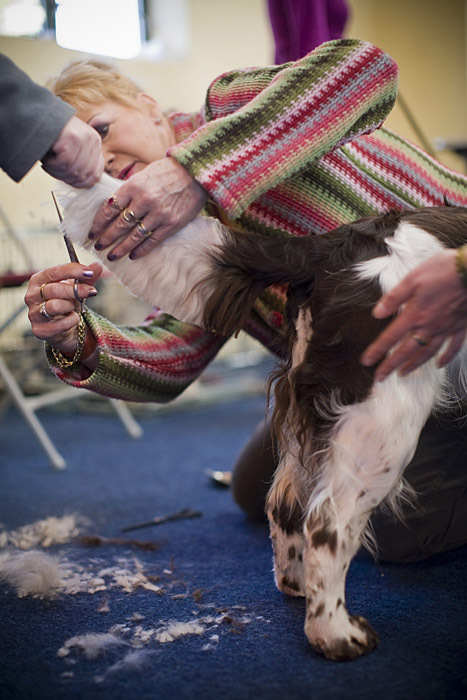 Despite the fact hundreds of people turn up everyday, each with their own tragic stories having suffered from polio or traumatic limb amputations, the centre has an incredibly positive atmosphere. For many it is the end of a long journey from all parts of India having heard about the service the centre provides. For all it will mean a life changing moment. 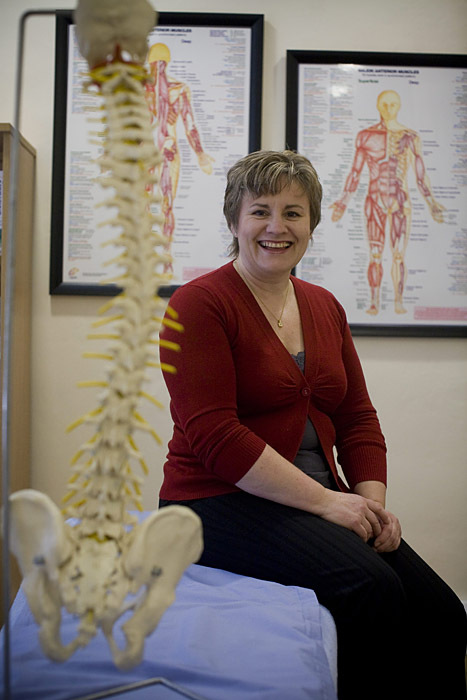 Many patients haven’t been able to walk properly for years as they enter through the gates in the morning then stroll out at the end of the day on new limbs. 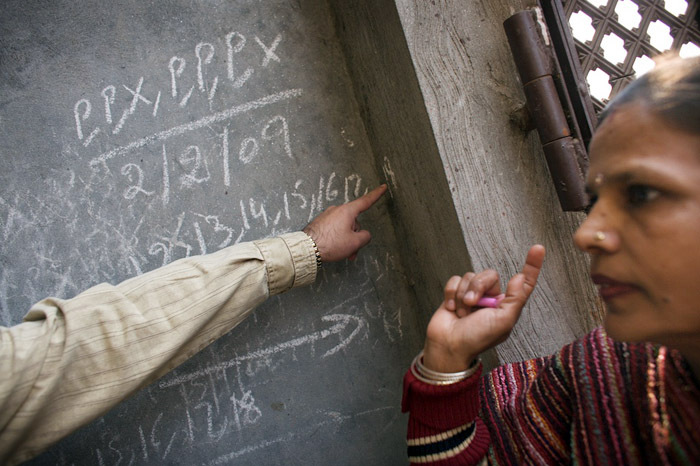 Rajneesh Pandy (24) is from Nalanda in Bihar state northern India, one of the most polio affected regions. 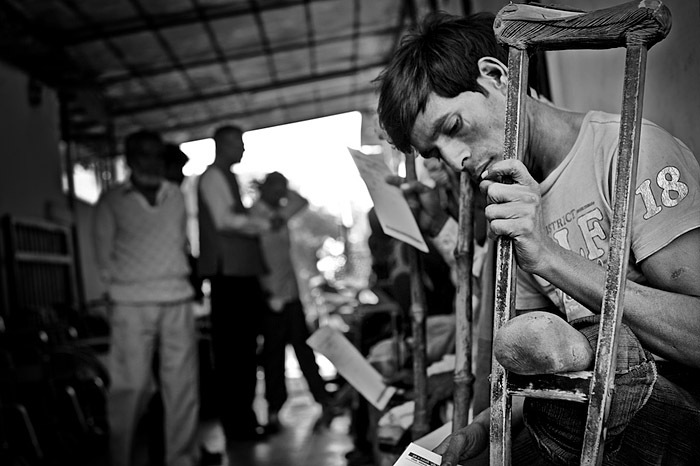 He caught polio when he was one and has remained unemployed despite going through school. Following his 27 hour train journey he hopes to return with a tricycle which will enable him to set up a mobile shop selling cigarettes, biscuits and sweets. 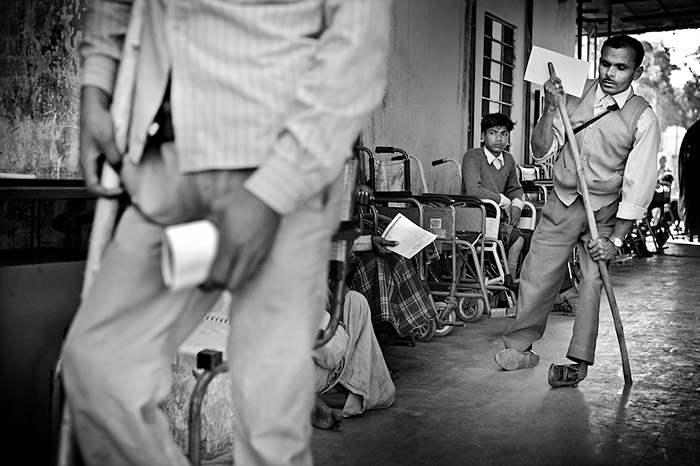 Polio patients and amputees leave the assessment centre to go for their limb fittings. 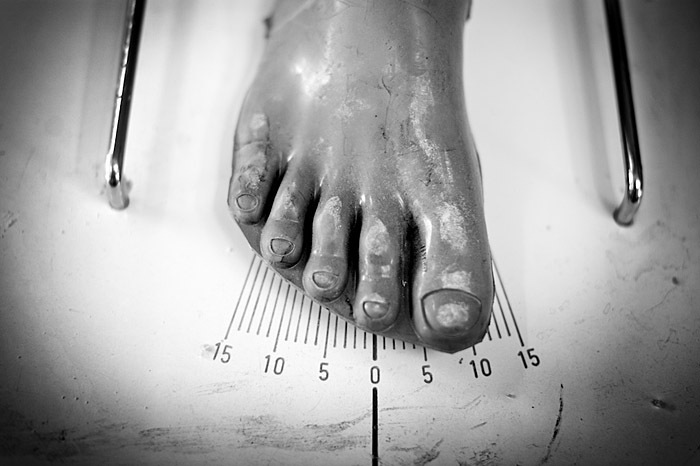 A prosthetic foot being being checked for accuracy before being finally shaped and fitted. Technicians fit a new limb to a double amputee patient. Many polio victims end up on the streets. Unable to find employment they sometimes resort to begging. 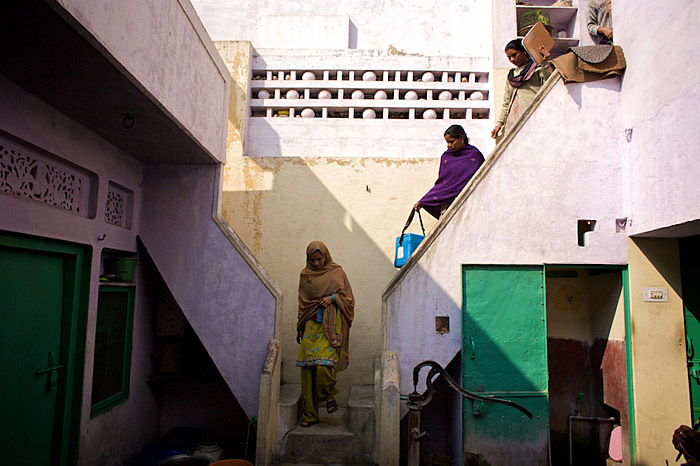 Anpurna (35) caught polio soon after birth and her parents died when she was two. 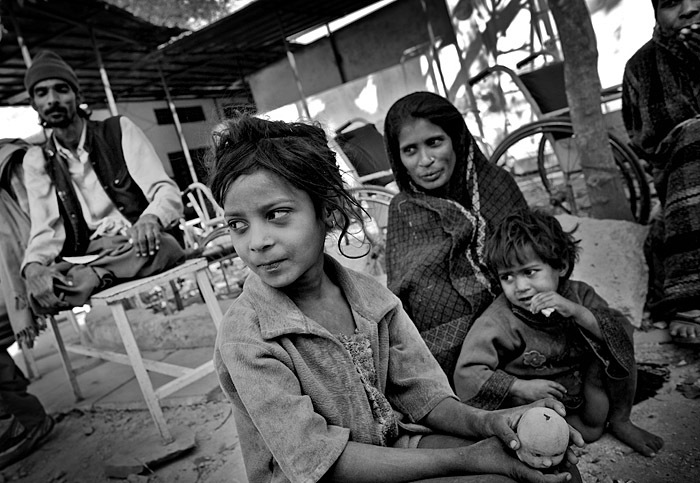 She and her husband came to Jaipur as they were told a tourist centre was better for begging. The aim of the second part of the polio eradication story is to show what effect polio has on people and what will happen if the eradication program fails. 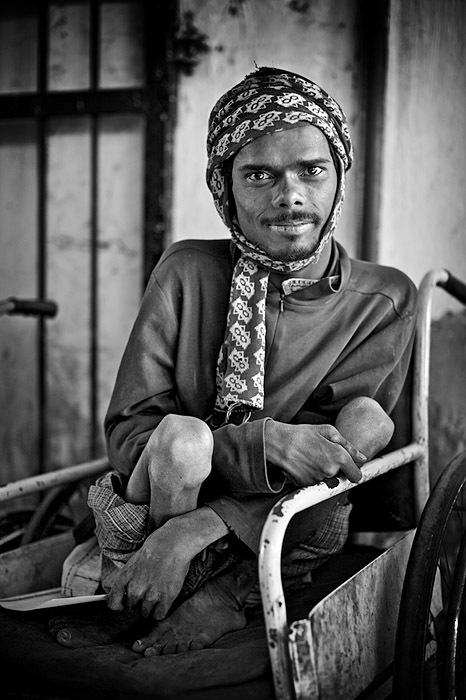 There over 350,0000 polio survivors in India, many with crippling limb deformities. 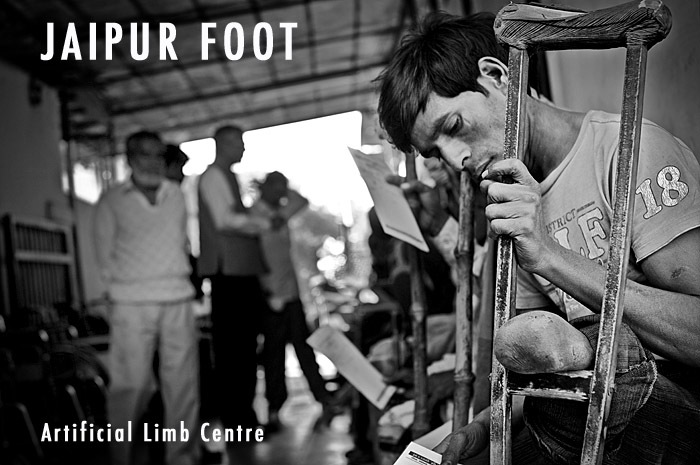 The Jaipur Limb Centre is seen as a centre of hope for their future. An incredibly uplifting place, hundreds of people with all manner of limb trauma, polio and other debilitating injuries arrive every morning. They are all seen personally by the founder D.R Mehta, a tall, energetic 70 year old ex civil servant who saw an inadequacy in this area of health care for the poor following a life threatening car crash. Since founding the centre in 1975, over 1 million people have had their lives transformed by making them mobile, regaining self respect and their human dignity. Within hours of reaching the centre, they are sized, fitted and taught how to walk again on their new artificial limbs. 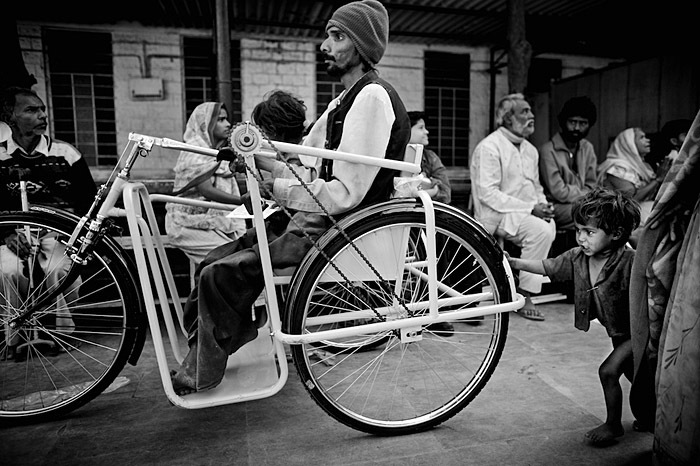 Polio survivors are given tricycles which can be seen all over India being used as tea shops or telephone booths making them financially independent, sometimes for the first time in their lives. 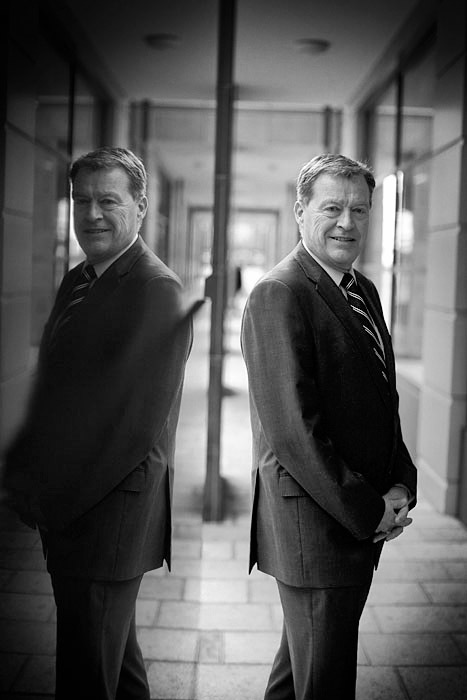 The pics below are black and white as I feel that fits the situation but will look at that again after another edit. The last working day tomorrow then back home to prepare for the Jersey Rotary launch evening at Government House on March 3rd. I’ll try and post again but please feel free to check back for further updates and the full stories from both India and Mongolia in the next few weeks.. 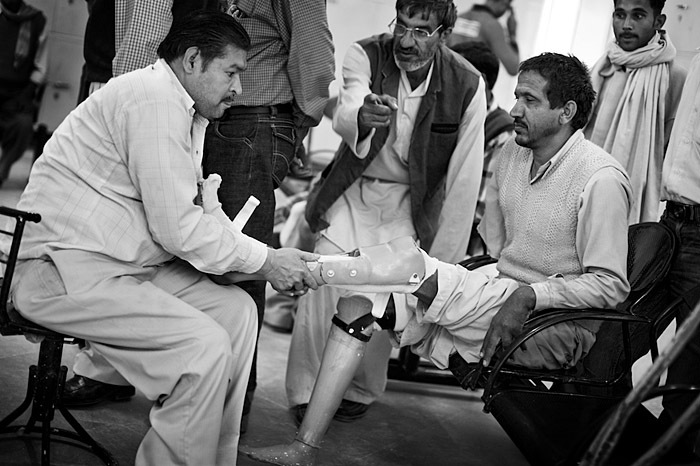 Founder of the Jaipur Limb Centre D.R Mehta talking to Pinod (36), a polio survivor. 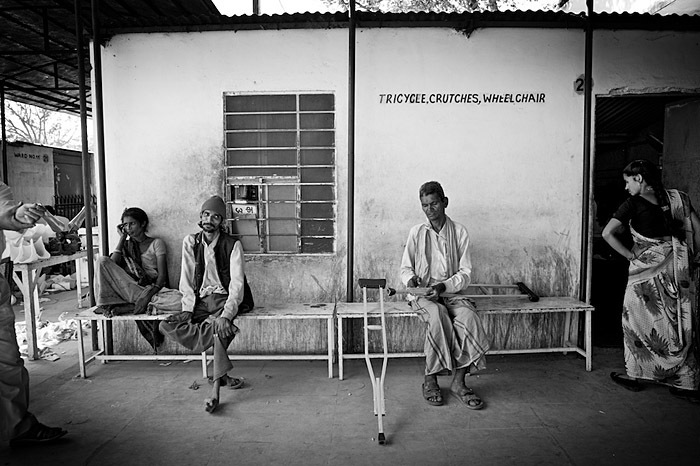 Since setting up the centre in 1975, over 1 million polio and limb trauma patients have been treated, usually from the poorest sections of Indian society. 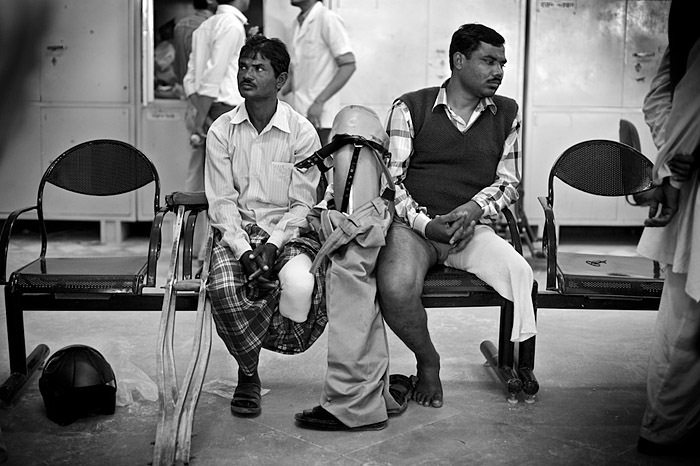 A Jaipur artificial limb stands between two amputees waiting for a limb fitting. 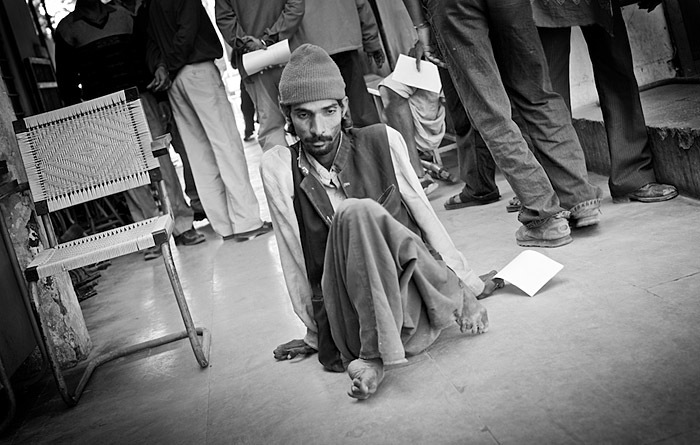 A double amputee in the overnight dormitory awaiting treatment the next morning. 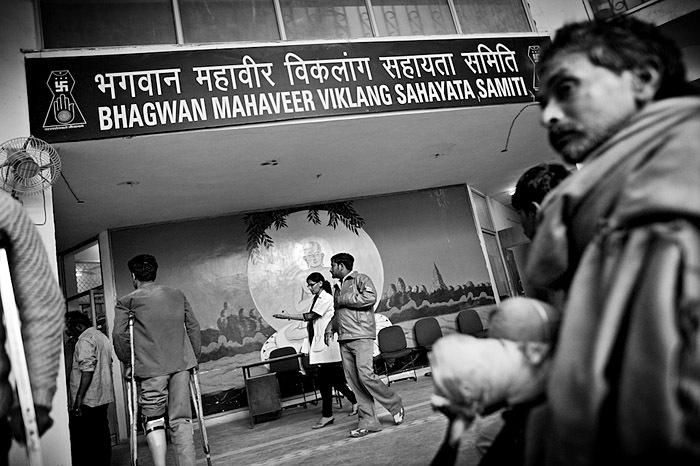 Every day hundreds of patients from all over India turn up for treatment and not everyone can be seen that day. 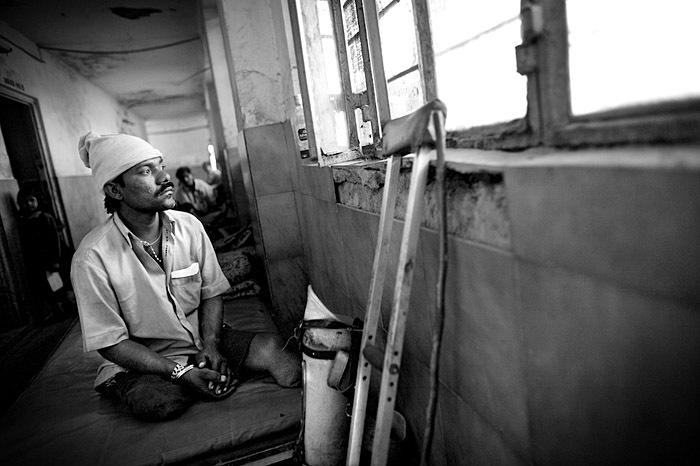 Gajanand (35) caught polio as a child and suffered severe leg paralysis. He lives in Mumbai and travelled over 1,100km to Jaipur to receive a Tricycle to help him work. 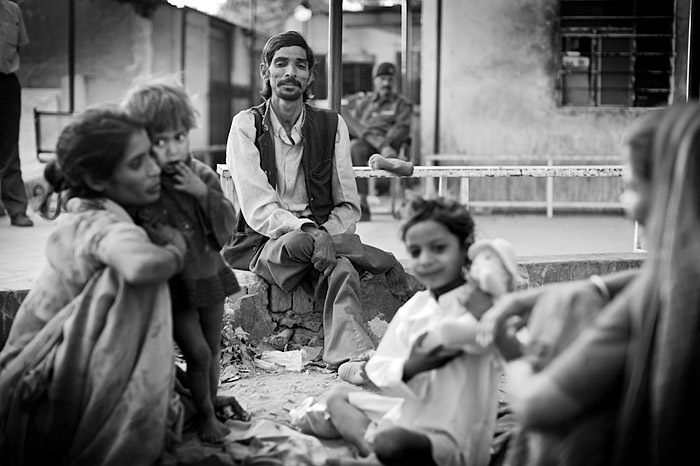 When he arrived with his wife and 2 children they had just 20 rupees left (about 30 pence). Gajanand gives his daughter Pooja (5) some water whilst they wait to be seen by technical staff. Gajanand (35), his wife Radha (30) with Pooja (5) & Sonu (2) come from a very poor background in Mumbai. 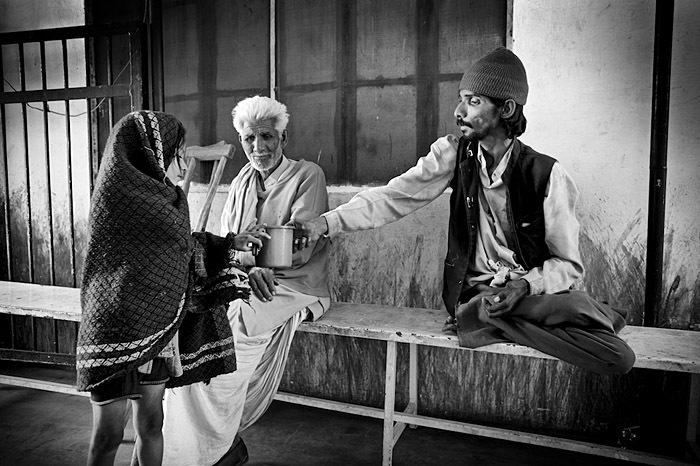 Radha earns some money by making tea but Gajanand hopes to make money selling cigarettes and other goods once he becomes mobile with his tricycle. Gajanand waits outside the office dealing with the tricycles all day. Gajanand (35), his wife Radha (30) with Pooja (5) & Sonu (2) come from a very poor backgrond in Mumbai. Radha earns some money by making tea but Gajanand hopes to make money selling cigarettes and other goods once he becomes mobile with his tricycle. Gajanand tests out his new tricycle with the aid of his youngest daughter Sunu (2) pushing behind. The family will be given clothes, a small business start up kit and a train ticket back to their home in Mumbai to hopefully have a fresh start in life. I’ve just arrived in Jaipur, Rajestan and it’s the first time I’ve had access to the internet so apologies for the delay in posting. The last week has been an incredible experience of Indian Rotary hospitality, long days and witnessing one the biggest medical logistical challenges happening in the world today. The full story and set of pictures will be posted when I’ve had time to edit upon my return to Jersey next week but below are some images from the last few days. As explained in the previous post the aim of this trip is to report on the final push to eradicate Polio from the world and the work Rotary International is doing to make that possible. 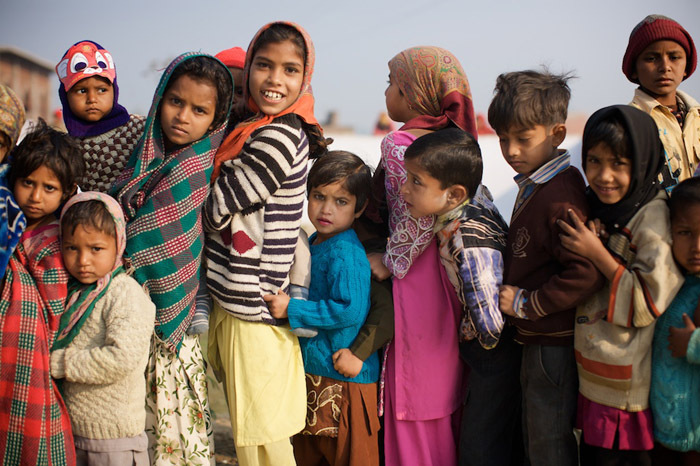 India is the most affected country and the story starts in Saharanpur, a city of over a million in the state of Uttar Pradesh, one of the poorest and most Polio affected regions. India held a National Immunisation Day on Sunday the 1st Feb and in Saharanpur alone, over 51,000 children under 5 were immunised that day. There were over 2,000 booths around the city manned by Rotary volunteers, Indian Government workers, WHO & UNICEF staff. The following 5 days involved ‘mop up’ operations where vaccinators visited every household in the district making sure each child received their 2 drops of polio vaccine. By the end of the week more than 110,000 children in Saharanpur will have received their drops. A massive logistical undertaking and amazing to believe that this takes place in every city, town and village throughout India with over 175 million children nationwide being vaccinated. 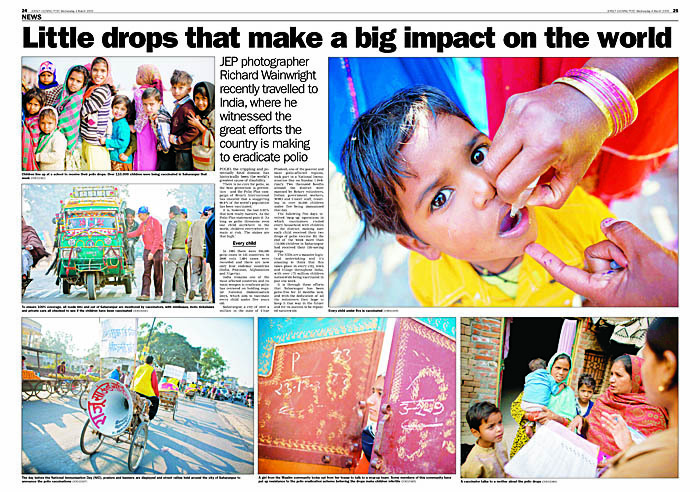 The day before the National Immunisation Day (NID) posters, banners and street rallies are held around the city of Saharanpur to announce the polio vaccination day. Children line up at a school to receive their polio drops. 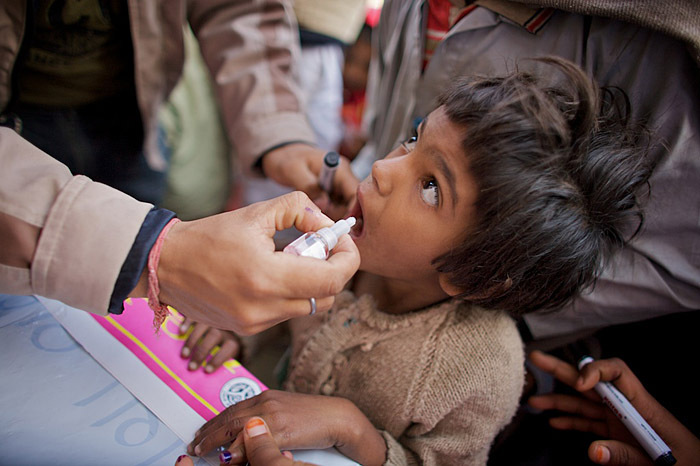 Over 110,000 children under 5 will be vaccinated in Saharanpur alone over the next week. Over 175 million will be vaccinated nationwide. 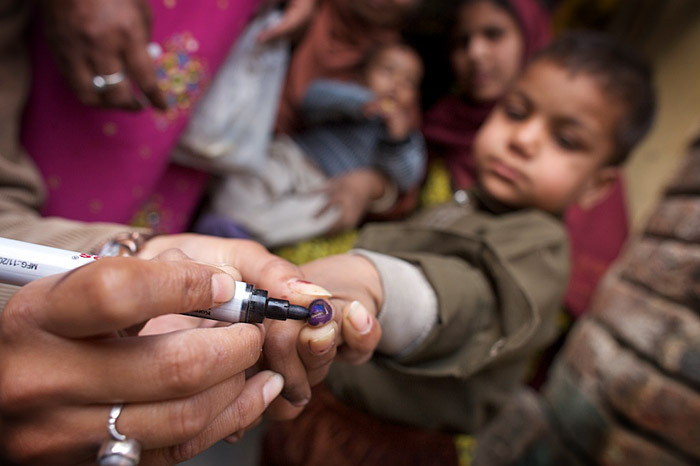 A young girl receives her polio drops. Each child is given 2 drops. 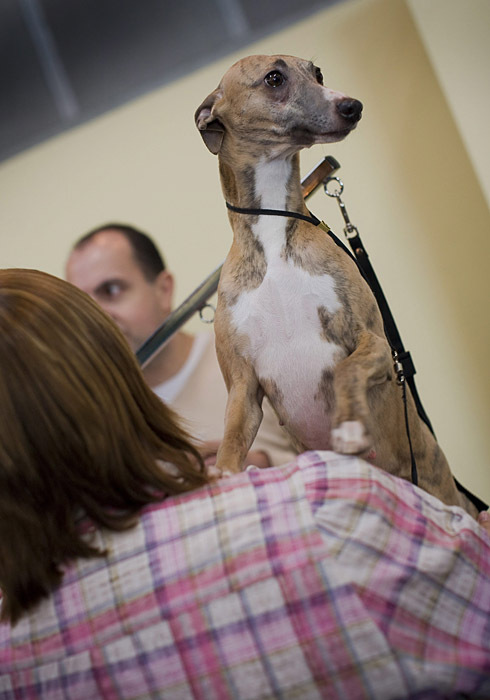 The left little finger is painted with a purple dye indicating they have been vaccinated. On the NID over 2,000 booths are set up around the city. 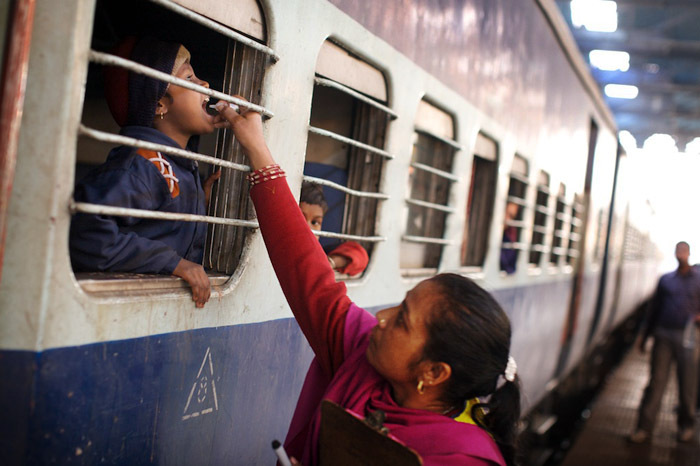 There are also hundreds of vaccinators on railway station platforms and bus stations to catch any children traveling that day. Vaccinators during the mop up days visit every house with children to ensure 100% coverage is attained. Every household with a child is marked during the mop up days showing either all children have been vaccinated or there is still some missing. Here this housing complex has multiple families, with a P indicating all have been vaccinated and an X showing some children still need to be seen. 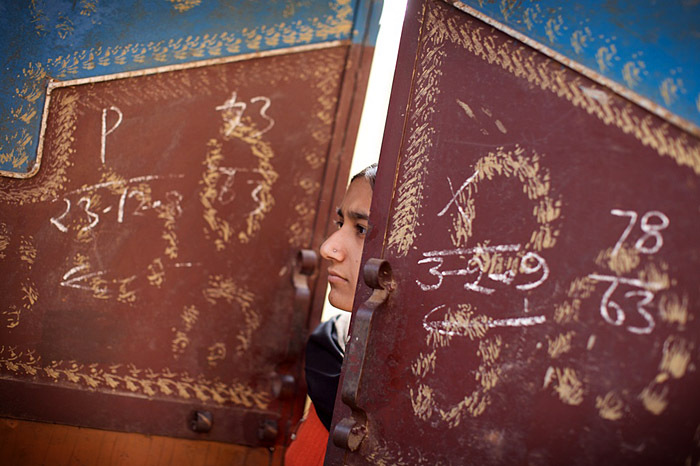 A girl from the Muslim community looks out from her house to talk to a mop up team. Some members of this community have put up resistance to the polio eradication scheme believing the drops make children infertile. I arrived back on time from Mongolia, downloaded and backed up all the pictures and I’m now preparing to go to India this afternoon. It’s very unusual to have two foreign assignments almost back to back but this one was dictated by a specific date. 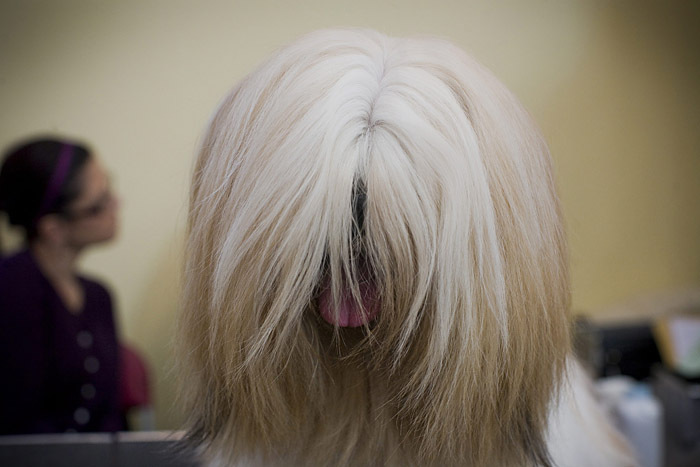 It’s going to be quite tiring but I’m certainly ‘in the zone’ from the Mongolia trip and ready for another challenge. I’ll hopefully start blogging and posting some images in the next few days. The main NID or National Immunisation Day is Sunday February 1st when over 172 million children under 5 will be vaccinated throughout India. A quite mind boggling statistic…!! My last post from here. A big thank you to everyone who helped me with this assignment, you know who you are. 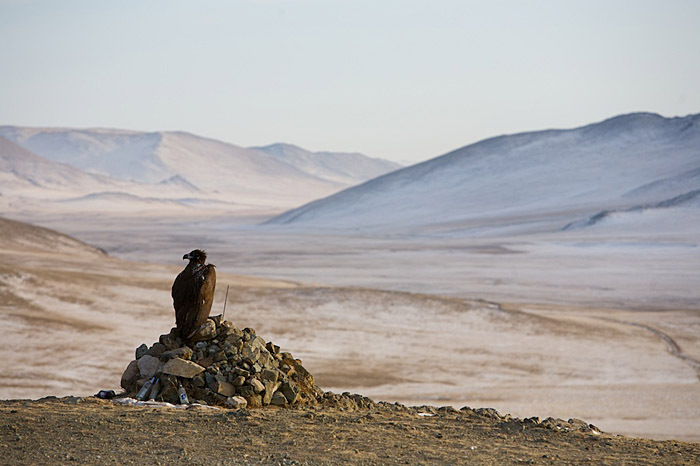 Just to say Mongolia is an amazing country. It has its problems but which country doesn’t. The Government are trying to sort things out with regards to street children but it will be a long process. I understand from people living here things have dramatically improved over the last year so there is hope. If you ever have the chance to visit then do. The hospitality is great, the countryside is there to explore and there is more history than you could ever soak up. Fond memories of all the people and I hope to return at a warmer time..therefore my last image will be from a very short trip into the countryside..
My last day in Mongolia. I managed to catch up with the guys again today. When Ider and I arrived they were laughing. During the night older men came into the hole to seek shelter. When they left they stole a pair of their shoes so now they have only one pair between them and they found this quite amusing in a resigned sort of way. 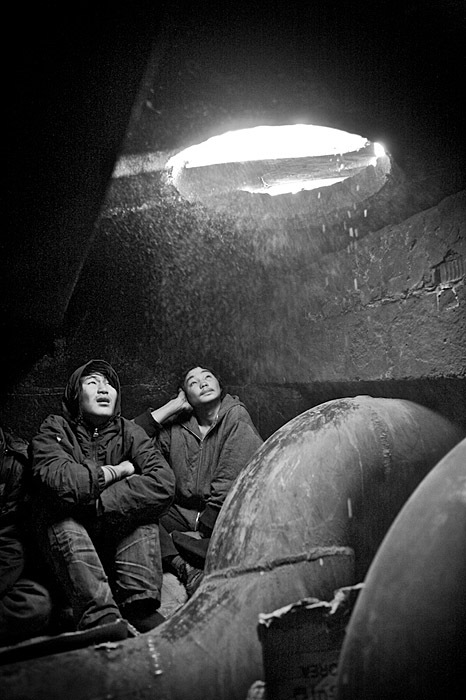 This sort of thing happens to all the children living in manholes around the city. They are never secure or safe anywhere be it from drunk older men or other street kids. 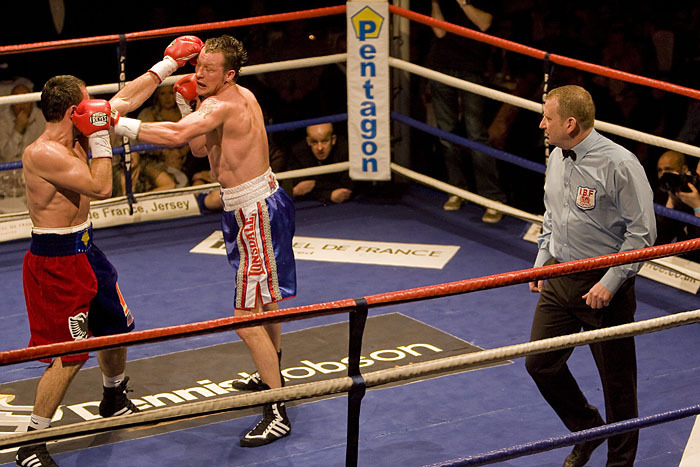 Violence is never far away. I have only met a few girls living like this but the situation for them must be incredibly dangerous. We left them with an offer of assistance from an NGO to get some help, two pairs of thermals I won’t be needing and enough money for shoes. Ider the interpreter will be keeping an eye out for them so will post any developments here. 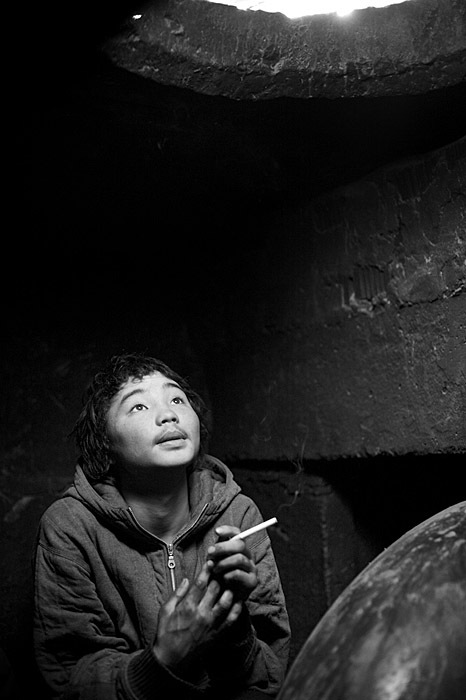 Munkhbat (15) & Altangeret (15) light each others cigarettes. They normally are given these from people when out collecting bottles. Altangeret (15) looks out of the manhole. They can clearly hear life going above them such as people talking and laughing, traffic and the occasional dog sniffing around. Dust falls through the manhole as people walk over them, mostly oblivious to their existence. They are extremely sensitive to any new sound or movement at the entrance as this generally means trouble and possible violence. Copyright © 2008-2019. Richard Wainwright Photography. All rights reserved.